I was lucky enough to share a cup of coffee on Tuesday with Chris Taylor, director of Food Fight, a documentary that portrays the history of America’s food system and America’s current food culture. The documentary was screened on campus by FLO Foods. The film was certainly provocative; charts and graphs of the death of farms in the U.S. after WWII were shocking, and interviews with food world royalty (Michael Pollan, Alice Waters, Marion Nestle, and more) that detailed the current state of things were depressing. But after much more reflection, I realized the gastronomic opportunity that we, as Carolina students, are presented with. The local food movement that is near omnipresent in the Triangle area is getting some national attention. The New York Times featured three of Durham’s restaurants that cook with a local conscious, all of which are about a 15-minute car ride away from campus. Weaver Street Market is an afternoon’s stroll away, the Carrboro Farmer’s Market allows customers to shake hands with their produce producers and Chapel Hill Creamery couldn’t produce more delicious cheeses. For those of us ready to make a statement with our food dollars, as Taylor said in his film, being a student in Chapel Hill is a great place to be. I’ve just started putting this “Eat Local” mantra to the test. Can you reasonably, affordably and satisfactorily eat food produced locally and not eat salads every meal? Today was incredibly successful. 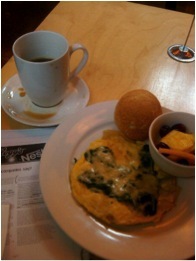 I visited Guglhupf on 15-501 and had a delicious brunch. I ordered the frittata special which changes daily. Mine arrived with spring onions, asparagus and goat cheese, along with fresh fruit and a hearty hunk of freshly baked baguette. Along with a coffee from Carrboro Coffee Company, it was a breakfast fit for a paper-writing machine of a college student. And for $6.75 my stomach couldn’t have been happier. So my Food Fight continues, hopefully with just as much delicious success. Check out the October issue of Blue & White, on stands now!